(c) Brighton Pittsford Post, October 2012. Rochester, N.Y. — When John Walsh moved to Rochester in the fall of 2009, he set a goal for himself to make sure he grew the sport of squash at the junior level. Nearly three years later, Walsh is starting to see a return on all of the hard work has put into the project. 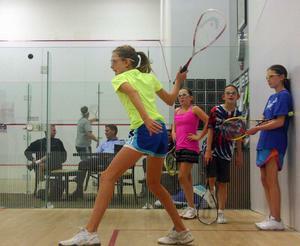 Squash has seen a surge in popularity on the youth level leading to the formation of three high school teams. 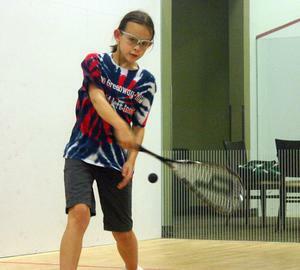 Walsh will lead the first McQuaid squash team this winter. Squash is popular on the youth level in many large cities throughout the Northeast including New York, Philadelphia and Boston. Rochester’s top youth players have been hitting the road to compete in tournaments in those cities due to lack of opportunity locally. “It is very cool to travel because you get to see how other kids are doing and how you compare to them because there is not many kids who play here,” said Caroline Mollenkof, 12-years-old, who works with Walsh at Midtown and travels to play in tournaments. Walsh has been pleased with the turnout of the McQuaid athletes, and this year’s roster will even feature athletes currently competing in other winter sports. McQuaid’s schedule will feature plenty of road matches in Buffalo where squash is popular on the junior level. Walsh and the rest of the Rochester Squash Racquets Association, a group devoted to growing squash locally, are working on the sport’s biggest problem: finding more courts. The group is working with the Rochester Prep School Group to build a new facility within the next couple of years. 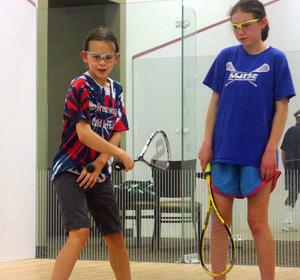 Sisters Jackie and Maddie Hager, who attend Twelve Corners Middle School, can often be found training with Mollenkopf in youth squash classes at Midtown. Even though they have only been playing for the sport for a couple of years, they expect to be playing squash into their teens and as adults. “You get a lot of exercise because you are running around so much and you can basically hit the ball as hard as you want and it will stay in,” Jackie Hager said. 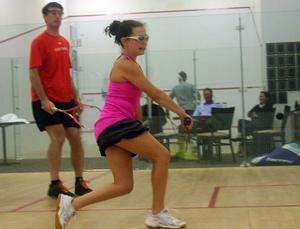 For more information on squash on the youth level contact Walsh at john.walsh@mini-net.com.